Restore balance to your face and accentuate your jawline – reclaim facial symmetry with chin procedures. If you’re unhappy with your jawline, it may not be the actual structure of your face that is off kilter. Aesthetic chin surgery can improve the asymmetrical balance of your profile or to correct a chin that lacks strength. If your chin is less “pronounced” or if your face seems to connect with your neck without any definition, a chin augmentation can be an option for patients who have otherwise normally functioning jaw development. What are the benefits of getting chin implants or chin augmentation? For starters, the chin implants offer a permanent method of strengthening your chin. Temporary fillers only offer a short-term solution, whereas chin implant surgery can be done by a qualified plastic surgeon to achieve a life-transforming change. The chin implants can also be done in conjunction with other surgeries, such as a facelift, rhinoplasty (nose job) or with a neck lift. If you are self-conscious about the appearance of your profile, chin surgery could be a strong consideration. 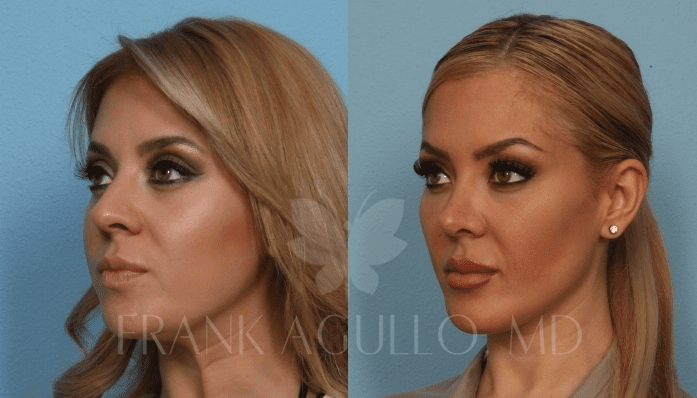 Dr. Frank Agullo specializes in facial cosmetic procedures in El Paso and Southwestern Texas. He is double board certified in both Plastic Surgery and General Surgery, making him doubly qualified to perform both simple and complex facial reconstructive surgeries such as chin augmentation and chin implants. Aesthetic chin surgery can greatly add strength to a weak chin by augmenting the bony structure of your jawline. Dr. Agullo can make your chin wider or even lengthen your face ever-so-slightly to enhance not only the visual appearance of your chin but its functionality, also. Chin implants come in many sizes, shapes and materials. These are chosen based upon the changes you seek. The most common chin surgical technique is done by making an incision and then creating a pocket designed to hold the implant directly over the lower jaw bone. The incision is often made along the natural crease line so that when it heals, it is barely detected. Once inside, Dr. Agullo will gently stretch the tissue to position the implant. A solid silicone implant is most often used and feels just like normal tissue. It will be shaped to fit your needs. Using his skilled hands, the surgeon then inserts the silicone into the pocket he has created for it. The tiny incision is made just underneath your chin and is only big enough to apply the implant. However, if other biocompatible materials are used instead of silicone – such as Medpor – then the incision will be made on the inside of your mouth. Although this material is more rigid, it is more effective for some individuals depending on the problem they face. In both techniques, the chin implant is securely positioned within the snug pocket or by fastening it to the soft tissue or jaw bone directly. The surgeon will then close the incision to complete the chin implant surgery and the whole thing will be done in less than an hour, unless other procedures are to be done at the same time. The surgeon uses special tape to hold the implant while it is healing. This is applied on the lower portion of the patient’s face where the incision has been made through the skin. Some cases may require chin reduction, in which case the incisions are made in the same manner as in augmentation. The exception here is that instead of placing an implant, the surgeon will sculpt the bone to a more desirable size. You can expect to be under local anesthesia or general anesthesia for chin surgery. Depending on the extent of your procedure, the doctor will work on your chin within an hour or several hours if combined with other cosmetic procedures. Before committing to chin implant surgery, you can look at the results beforehand. Dr. Agullo uses a revolutionary 3D Vectra imaging system to show you “now and later” images firsthand. This will be done while in the first consultation. Quitting smoking at least two weeks prior. Not eating or drinking after 12:00 p.m. the night before chin augmentation. Asking someone to drive you to and from the procedure. Having ice packs and bandages ready at your house. Avoiding any lotions, creams, makeup or shaving around your face and chin. Getting time off from work and other activities. Dr. Agullo is Southwestern Texas recent recipient of “Texas Superdoctor Rising Star” in cosmetic and reconstructive surgery, as recognized by Texas Monthly magazine. He will give you great advice on preparing for your chin augmentation. Just after your chin augmentation, Dr. Agullo will apply a dressing that should be kept on your face for two or three days. Your chin and face will feel very sore, tender and maybe painful. However, the postoperative discomfort can be eased with some prescribed medications if you desire. Chewing will be difficult for a few days following chin surgery; therefore Dr. Agullo will likely recommend a soft food and liquid diet. Your face may feel stretched, tight, and swollen. This will go away over time; usually after about a week. There may be bleeding for a few days, also. However if excessive bleeding is the case, call your doctor right away. Then within six weeks, your face will start to take shape and you will see the results in a new light. It will be important to remember that your healing takes time, therefore it would be wise to avoid major social obligations while your face is still in transition. The swelling and bruising will be unsightly for a while. But after it’s all said and done, your chin will look more pronounced and stronger. This can do wonders for your self-esteem and should make you smile a whole lot more! Are there risks with chin surgery? All of these complications or risks are quite rare, especially if the chin surgery is done within an accredited facility such as that of El Paso Cosmetic plastic surgery outpatient center. Pricing varies depending on the extent of the treatment or surgery. You can see a list of the approximate prices of each procedure on our current fee schedule. Dr. Agullo charges a consultation fee of $100, which is applied to the cost of your treatment. Generally speaking, cosmetic plastic surgery is considered “elective” and is not covered by most insurance plans. The prices listed on our fee schedule represent the minimum cost of the procedures, including anesthesia and surgical facility fees, medical tests, garments, and recovery products. The cost of prescription medications, however, is not included. The exact price of each procedure can only be determined after a thorough consultation. All fees must be paid in full prior to the scheduled treatment. The procedure can even be performed with local anesthesia alone. Dr. Agullo will give you an estimate during your initial consultation and can show you an example of what your jawline and profile will look like after it heals. This is done through the Vectra 3D imaging system. There are some people who require chin surgery for functional reasons, rather than entirely cosmetic. People who have trouble swallowing, chewing or who find discomfort doing regular activities may seek chin augmentation to improve both the aesthetic and functional use of their chins.